Now, LittleBigPlanet has certainly gotten its share of press coverage, though I have to admit I didn't pay it much mind given that for a very long time I had absolutely no plans to own a PS3. Sure, it was doing some cool things, but I just couldn't bring myself to really care. Having seen a level - albeit a basic, rudimentary one - created before my eyes, and getting a chance to play it through moments later? Well, I now fully understand why Escapist Section Editor Susan Arendt wants a Sackboy of her own so badly. The entire thing just put a smile on my face, the platforming was simple but intuitive, and the physics work incredibly well (much fun was had with rocket cars even after the "race" was over). 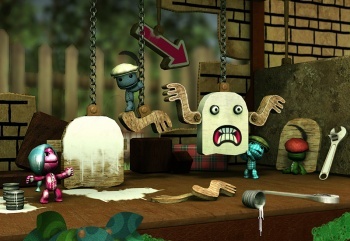 I'm not ready to drink the Kool-Aid just yet, but if there was a game that might lean me towards plunking down the cash for a PS3, LittleBigPlanet is it. While I'm not what you'd call a fan of sports games, I've always had a bizarre soft spot for snowboarding titles. While I never really had a chance to get my own hands on the game, Destineer's Stoked has some very nifty ideas under the hood. Instead of just rendering individual mountain faces or particularly well-known runs, the Stoked developers opted instead to just simply build, well, the whole mountain. At first, players will have to unlock different locations for the helicopter to drop them off, but once they've achieved a certain level of fame, they'll be able to fly the helicopter themselves, starting their run from anywhere they damn well please. Another nifty idea behind Stoked is the idea of real-time, dynamic weather: the demo actually crashed during my look at the game, but that turned out to be a hidden blessing - the reset took the game back two days (in real-time), and when we started back up there was much more exposed rock on Mt. Fuji, because the fresh snow hadn't yet fallen. Precipitation, temperature, and wind will all affect the landscape over time, meaning your runs down the mountain might not be the same. Sure, I've got a fondness for snowboarding games, but the six beautifully rendered mountains in the game combined with a robust and relatively original weather system make it hard for me to not be excited about Stoked.